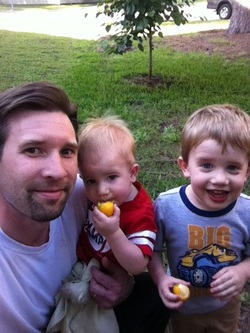 The boys and I eating kumquats. My name is Clayton, and I love learning about, growing, and sharing fruit. It is my mission to grow as much fruit as possible on my 0.2-acre suburban lot, so that my kids can go outside and pick a snack year-round. I have planted somewhere around 50 fruiting trees and bushes representing 100+ cultivars, with fruits ranging from the common to the exotic and unusual. I work as a geologist in Houston, Texas. My family and I live in the Northwest Houston-Spring area off of Highway 249.